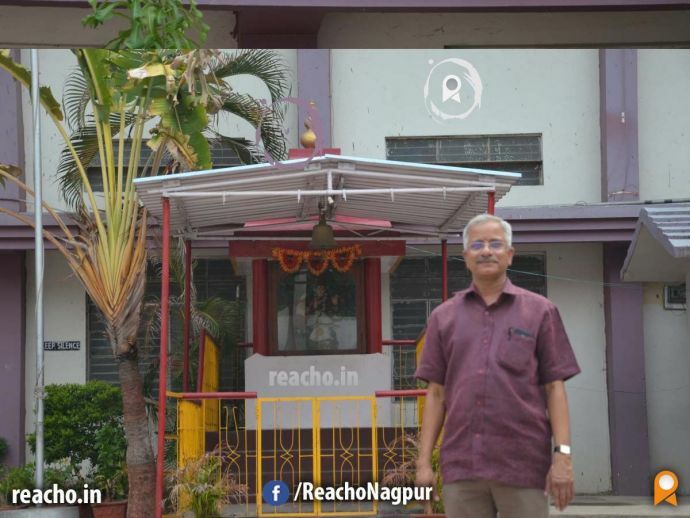 Saraswatians have persevered through rain and sun, quite literally, to emerge as the best! 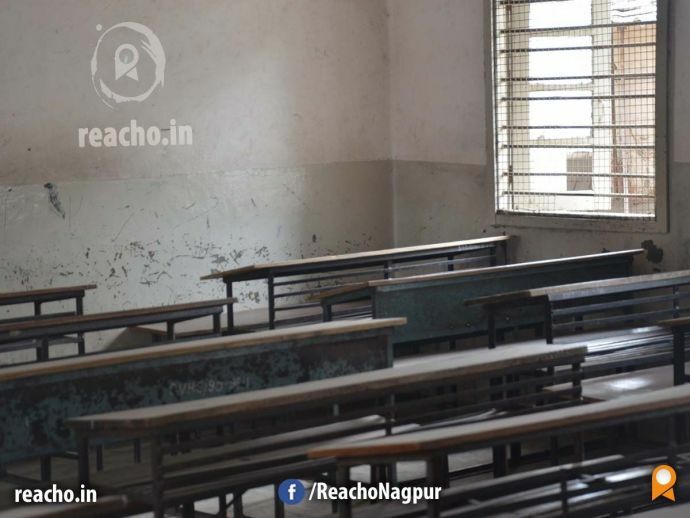 If you’ve ever stood at the Shankar Nagar square and wondered, “How on earth do these children study with so much traffic around them?”, then you clearly aren’t aware of just how noisy the students of Saraswati Vidyalaya can get. 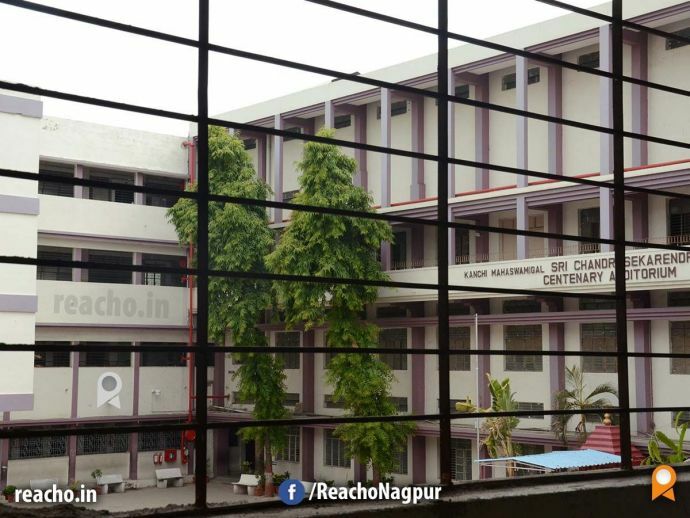 For over 100 years, this school has withstood the onslaught of rain, winter, and the harsh Nagpur sun and yet manages to produce some of the finest gems of students (ahem). From trying and figuring out the horrendous maths formulas and to trying and getting rid of the smell of various chemicals that we had to deal with for biology to figuring life out, we sure have grown up. But the mere musty smell of old basketballs or the mention of certain books has the ability to immediately take us back to those school corridors and all the memories just come rushing back. 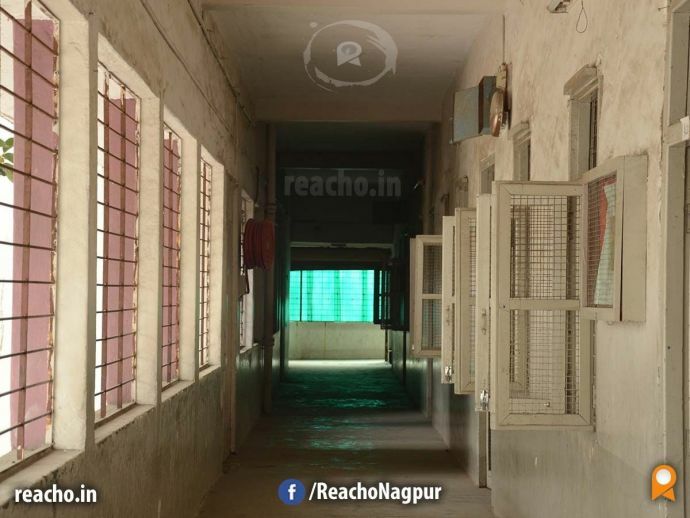 The gargantuan school campus made it mandatory for us to have two separate gates- one for the boys and one for the girls; and dare any boy come to the girl’s gate, he was chased away by all the security guards. And then there was the “autowala” gate where all the autowale bhaiyyas stood in perfect tandem (not) waiting for their respective children to get in. And the races that were held between two autos! Which takes me to the cycle stands and the numerous, brightly coloured cycles that we used. The girl’s stand was near the teachers’ parking and I cannot tell you just how many girls waited just to catch a glimpse of a certain male teacher they had a crush on! And then, there was the boy’s parking. Who can forget the toppling of the cycles like dominoes when a single one was pushed? Not only that, these parking lots also served as boxing rings for boys and as a semi-private space for the couples who wanted some “coochie-coo” time. Why there were couples in school, is still beyond me! The first thing you see, once you cross the parking lot, is the huge ground and a Saraswati temple because, 1) she is the God of education; and 2) school is temple, teacher is god, remember? 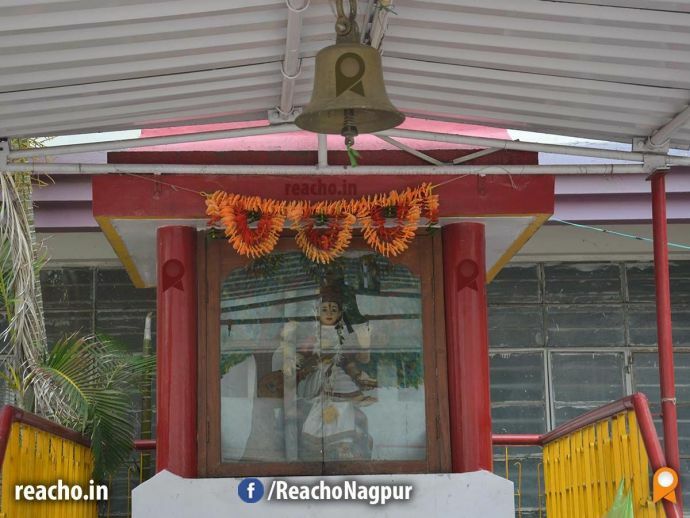 The temple has been as important a part of the exams as the students. 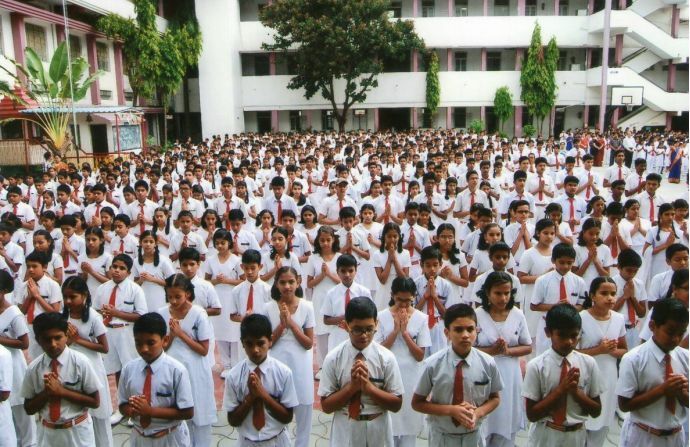 Since, there was a temple, there HAS to be a morning prayer and Arbedwar Sir, his posse of the prayer girls and boys and every other student singing the prayer in their own pitch. Other than that, the various songs we learnt just in order to impress the dignitaries who’d come to the Republic Day and Independence Day functions. 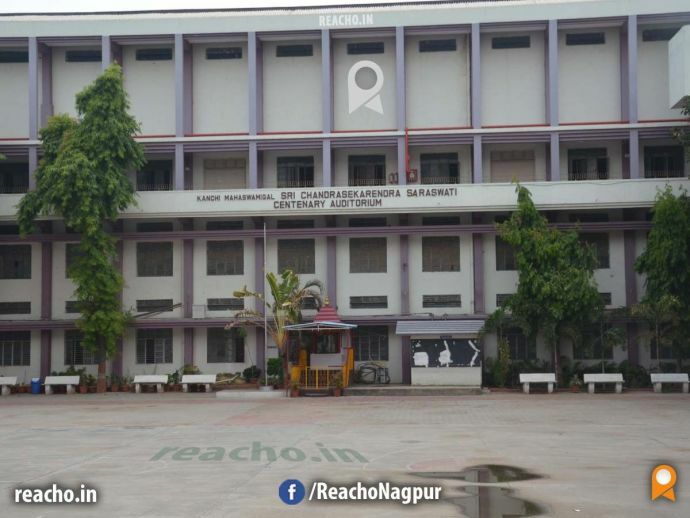 Saraswati Vidyalaya and the Nag “Nala” have forever been synonymous. Remember the rainy days when the school was flooded and the teachers were given the duty of ensuring that no one would go for a morning swim in the nala! Or even the beginning of the year vacation that we got simply because there was no way to enter the school. I think every school has the mandatory PT on Saturday and I don’t really get the point of waking the poor students up at 7 in the morning just to make them exercise! But, I have to admit, it was fun. The synchronised PT was also accompanied by a synchronised hum led by a senior that mysteriously begun and stopped. And who can forget stealing chalk pieces just to whiten the tennis shoes even more to avoid punishments? Or even the full-class punishments when one person did something and everyone was made to stand in the ground. The snickers and the games that we shamelessly played while being punished! The elections for the House Captains and Vice Captains as well as for the Head Boy and Head Girl whose pictures would be there in the diary. This was followed by Sports Day and the mad excitement that was there throughout the school for their House to win. The three days seemed like a picnic and no one would scold us for yelling ourselves hoarse or even when we behaved like some hooligans. If one mentions the Sports Day, can we forget the Gathering that always took place in December and was no less of a competition between all the classes? The dance and singing practices that begun in November included finding and hiring choreographers to ensure that our dance was indeed the best. Another three days of dancing, singing, warring wanna-be DJs and frustrated by happy teachers led us to the At-Home, the one day that the school gave the teachers permission to be our parents and feed us with everything they had! And in between all this, we also had the Teachers’ Day celebration that begun with the class 10 students dressing up as Teachers and teaching one class for 45 minutes. It ended with promises of being a good student that lasted till the next day and somehow just vanished. The school wasn’t all fun and games as we had Science and Maths Olympiads that, if I’m not wrong, were more often than not, won by the students of Saraswati Vidyalaya. And then there was the Annual Science Exhibition where everyone tried to showcase their scientific prowess over everyone else. 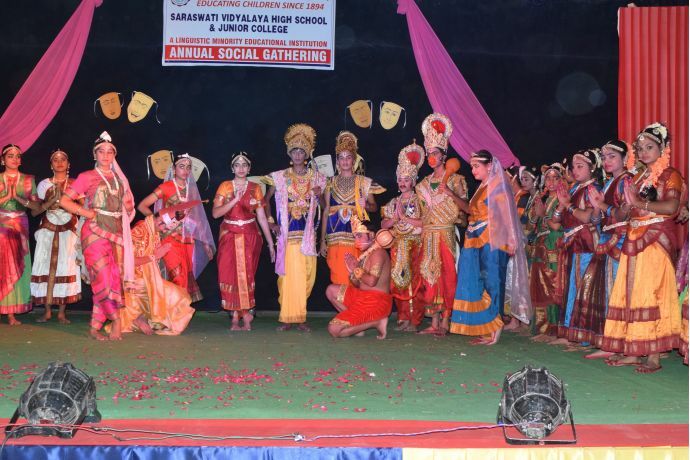 Though, there was another branch of Saraswati at Buldi, we rarely acknowledged it as a part of our school. The students from there came to ours after class 7th but even then, there was a certain rivalry between the students from both the “sister” schools. But this rivalry was instantly forgotten at the mention of a picnic that always went to Ramtek. An entire day spent with friends and teachers’ behaving like friends was all that we needed. The songs we sang, the food that everyone brought and was devoured within seconds of it being opened. And finally falling asleep on one another’s shoulders while coming back. I believe, us Saraswatians are spread out, not just across the length and breadth of India but also across the entire globe and each one of us is doing the school proud. 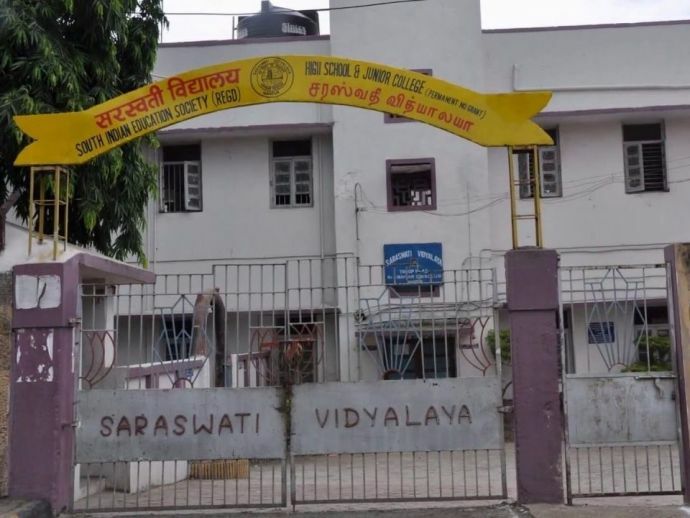 Cheers to all the people who’ve had the luck to have studied in Saraswati Vidyalaya!